Beckwith Macbro Sands produce all grades of resin-coated sands for shell core, shell moulding and proppant/frac sands for the oil industry. We manufacture using solid resin and hot coating technology, which results in a product that is of high quality, consistent and cost effective. Beckwith Macbro Sands can be used for all types of core and shell moulds. Applications include iron and aluminium for automotive companies including Ford, Proton and GM in South-East Asia, Australia and other countries. Silica, zircon and chromite sands can all be coated, or blends of the different sands can be produced, such as 50% zircon 50% silica. Sands of different AFS can be coated typically 50 to 90 AFS are used. Speciality blends using thermally reclaimed sand can also be manufactured for specific applications. Other additives can be added to improve operator comfort. For the oil industry a wide range of proppant/frac sand grades can be manufactured to meet specific requirements for sizing, strength and use. Improved build up, faster curing times, quicker cycle times and improvements in productivity. 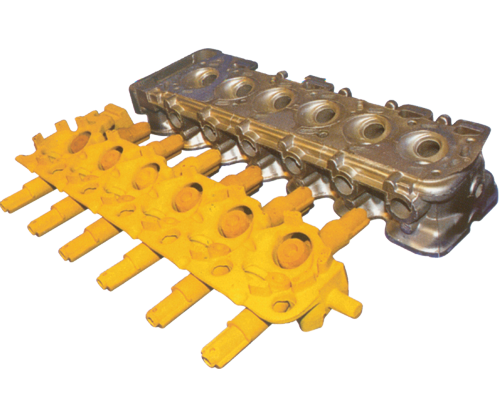 Less resin is required to attain the same strengths, which results in less fuming and emissions during manufacturing and casting. Lower resin additions results in lower fume emissions, both at the manufacture and casting states. This results in a cleaner working environment for your employees. On-site shell core and shell moulding facility so that the product can be continually tested, trialled and improved. A laboratory facility that continually tests to ensure that the sand produced meets the highest quality specifications.